Huawei AR1200 supports the following NAT features: static NAT, port address translation (PAT), internal server, NAT Application Level Gateway (ALG), NAT filtering, NAT mapping, Easy IP, twice NAT, and NAT multi-instance. The number of private addresses is equal to the number of public addresses, so it does not save pull of public addresses. Maps a public address to multiple private addresses. Hosts in the public network can access an internal server. Takes a public IP address of the interface as the source address after NAT is performed. Translates both the source and destination addresses. 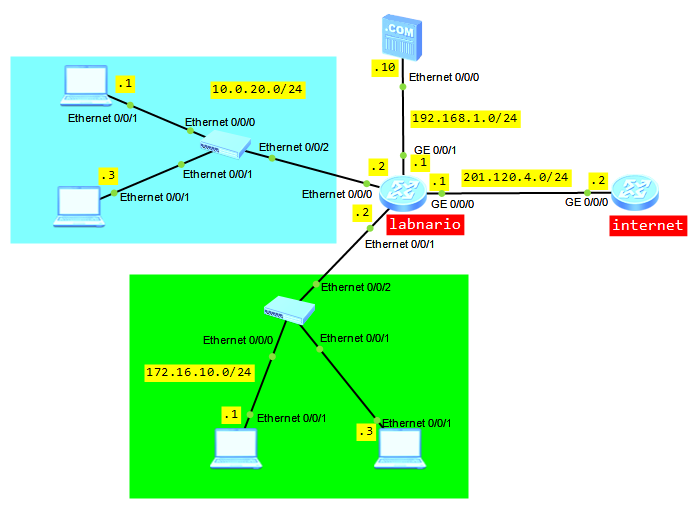 Using in the scenario where IP addresses of hosts on private and public networks overlap. Allows users on private networks to access the public network and allows users in different VPNs to access the public network through the same egress. In addition, users in the VPNs with the same IP address can access the public network. Supports association between VPNs and NAT server, and allows users on the public network to access hosts in the VPNs. This function is applicable when IP addresses of multiple VPNs overlap. Users from LAN 10.0.20.0/24 can access internet using a pull of public addresses. Users from LAN 172.16.10.0/24 can access internet using a public IP of WAN interface. Users from internet can access internal FTP server 192.168.1.10. No-pat indicates one-to-one NAT, that is, only the IP address is translated and the port number is not translated. After the NAT ALG function is enabled for an application protocol, packets of the application protocol can traverse the NAT server. The application protocol cannot work without the NAT ALG function. Unfortunately, even NAT commands are supported by eNSP simulator, it does not mean that NAT is supported as a whole. Internal hosts cannot communicate with internet and internal FTP server is not available for public users as well. But this is what I wanted to show you. You can check this NAT configuration on real devices. It should work properly.